303rd Mission #27, 8th AF Command Mission #48, 31 March 1943 to Rotterdam, The Netherlands with six members of the original Capt Lewis E. Lyle Crew. 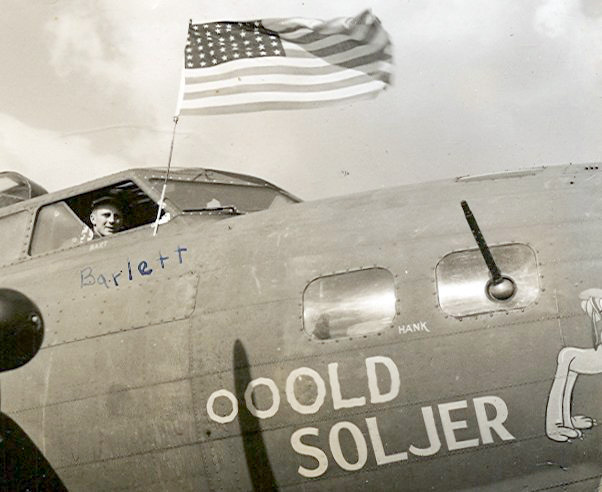 in B-17F Ooold Soljer #41-24559 [8 KIA & 2 Bail-outs and returned to Molesworth]. Ooold Soljer had a mid-air collision with B-17F #41-29573 Two Beauts (358BS) VK-H, Lt James R. Dunn (P) [7 KIA & 3 Bail-outs & returned to Molesworth]. The two B-17s collided when the tight formation passed through 10/10th clouds in the vicinity of Wellingboro, England. Ooold Soljer lost its right wing from the #4 engine out. 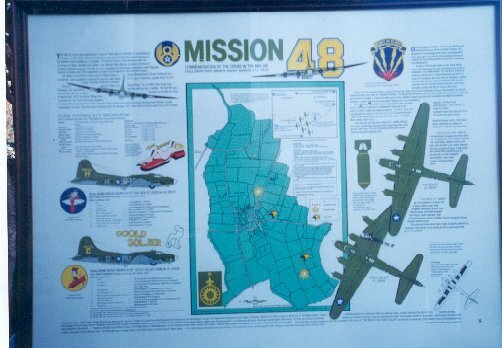 Both B-17s crashed near Mears Ashby, England. A memorial was erected at Mears Ashby on 31 March 1996. Dispatched on 12 missions with Lyle Crew - 4 as Tail Gunner/Observer- 1(TG/O), 9(CP), 10(CP), 11(CP), 12(TG/O), 13(CP), 14(TG/O), 15(CP), 18(CP), 22(CP), 23(TG/O) & 26(CP). Upgraded from CoPilot to Pilot on 22 March 1943. Buried in Cambridge American Cemetery, England. 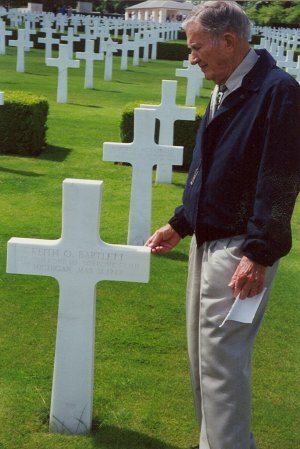 T/Sgt Gene K. Smith (E) - Two missions with 1Lt Bartlett - 25, 27 (KIA). Dispatched on 17 missions with Lyle Crew - 1, 2, 5, 9, 10, 11, 12, 13, 14, 15, 16(A), 18, 19, 20, 22, 25 & 26. Buried in Cambridge American Cemetery, England. T/Sgt Clayton S. Balcombe (R - Two missions with Lt Bartlett - 25, 27 (Bail out & WIA). Dispatched on 17 missions with Lyle Crew - 1, 2, 5, 9, 10, 11, 12, 13, 14, 15, 16(A), 18, 19, 20, 22, 25 & 26. After recovering from his wounds was dispatched on 12 additional missions with the Lt Murdock B. McMillan, Jr. Crew - 172, 174, 176, 178, 179, 180, 181, 182, 183, 184, 185, 186. Thirty mission combat tour completed on 23 June 1944. S/Sgt Edward A. Bradford (LWG) - Two missions with Lt Bartlett - 25, 27 (KIA). Dispatched on 15 missions with Lyle Crew - 1(RWG), 2(RWG), 5(RWG), 9(RWG), 10(RWG), 11(RWG), 12(RWG), 13(LWG), 14(RWG), 16(A)(RWG), 18(RWG), 19(RWG), 20(RWG), 22(RWG) & 26(LWG). Buried in Cambridge American Cemetery, England. Sgt Tom McGiffin (RWG) - Two missions with Lt Bartlett - 25, 27 (Bail-Out). Dispatched on 14 missions with Lyle Crew - 5(TG), 9(TG), 10(LWG), 11(LWG), 13(RWG), 14(TG), 15(LWG), 16(A)(TG), 18(LWG), 19(LWG), 20(TG), 22(TG), 23(TG) & 26(RWG); Last mission with Capt Jacob W. Fredericks Crew - #28. Removed from combat status following mission #28 on 4 April 1943. 1Lt Kent M. Fitzsimmons (CP) - Two missions with Lt Bartlett - 25, 27 (KIA) Dispatched as CoPilot on nine missions with four other crews: 2Lt John A. Castle - 1, 2, 4, 5, 7 & 11; Lt Martin E. Plocher - 15; Lt A.F. Bilek - 17(A); 1Lt John A. Farrar - 22. Buried at Cambridge American Cemetery, England. Lt Samuel H. Anderson (N) - One mission with Lt Bartlett - #25. Dispatched on 24 missions with other Pilots: 2Lt John A. Castle Crew - 1, 2 & 4; Became a Lead Crew Navigator and flew remaining missions on a Lead Crew with various Squadrons: Capt Lewis E. Lyle (360BS) - 5, 12, 16(A), 19, 20, 26, 31 & 36; Other Lead Crew Pilots and Squadrons - 6, 7, 9, 10, 11, 15, 18, 21, 24, 27, 28, 30 & 34. 25 mission combat tour completed on 15 May 1943. 2Lt Walter T. Stevens (N) - One missions with Lt Bartlett - #25. 1Lt Richard C. Browning (N)(359BS) - One mission with Lt Bartlett - 27 (KIA). Dispatched on 15 missions with the original 359BS Lt Ross C. Bales Crew 1, 2, 7, 9, 10, 11, 14, 15, 17, 18, 19, 21, 22, 24 & 26; One missions with Col. Robinson / Maj Romig Lead Crew - 8. Buried in Cambridge American Cemetery, England. Lt Herman C. Currie (B) - One mission with Lt Bartlett - #25. Dispatched on 22 missions with the 1Lt David S. Clifton Crew - 27, 28, 29, 30, 31, 32, 33, 35, 36, 37, 38, 39, 40, 41, 42, 43, 48, 49, 50, 55, 59 & 64; One mission with Lt Loyd D. Griffin - 24; One mission with Lt John J. Casello as an Observer - 52; Two missions with Lt Robert W. Cogswell - 58 & 61. Completed 25 mission combat tour on 27 August 1943. S/Sgt Claude A. Hamilton (Togglier) - One mission with Lt Bartlett - #27 (KIA). Dispatched on seven missions with three other Pilots: Lt Martin E. Plocher - 15 (Tog); Lt Loyd D. Griffin - 17(LWG), 23(Tog), 24(LWG), 25(LWG), 26(LWG) ; Capt Lewis E. Lyle - #20 (LWG). Buried in Cambridge American Cemetery, England.